Our Water Softeners are brilliantly designed to work. Period. Our Water Softeners will provide your family with abundant, clean, soft water on demand. From multi-tank systems powered by the energy of moving water to a more traditional approach, we cover all your options. 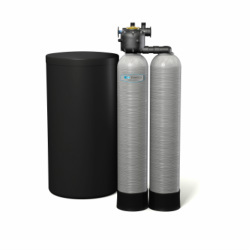 Household Water Specialist is very proud to provide this region with the best water softener options on the market. Request a free water consultation and one of our water consultants will help you determine which one of our water softeners are right for you. It's that easy! We have taken our best softener and made it even better. With improvements that make them more efficient and effective, Premier Series softeners are ideal for homes with challenging water conditions. These high-flow systems are comprised of multiple tanks, so you will have a supply of continuous soft, clean water. Premier Series systems only operate when needed, without the use of electricity, so you will not have any computers or timers to program, set, repair or replace. Click here for a free consultation about your water. Tried and true engineering and design went into the Signature Series water softeners. 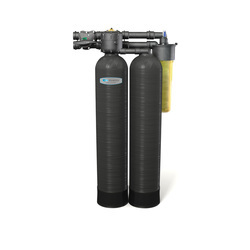 If you are not faced with difficult water problems, yet you want your water to be better than it is, a Signature Series softener is right for you. It's twin tank design, combined with non-electric, on demand operation mean your water issues will be history. And so will any hassles or inconveniences you may have experienced with other water systems on the market. What you will have is an unlimited supply of soft water. Click here for a free consultation about your water. 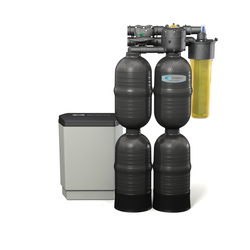 Powered by the kinetic energy of moving water—not electricity—these unique water filter and softener combination systems soften and remove sediments or chlorine from your family's water. The unique multi-tank system provides a reliable, continuous supply of clean softened water with no timers or computers to set, adjust, repair or replace. Click here for a free consultation about your water.